Realtree.com editorial director and turkey hunting editor Steve Hickoff was born and raised in north-central Pennsylvania's upper Appalachia region. It's there he first turkey hunted. His byline has appeared in most major sporting print and online publications, including Outdoor Life, Field & Stream, Gray's Sporting Journal, Turkey Call, Turkey & Turkey Hunting and Turkey Country, among others. 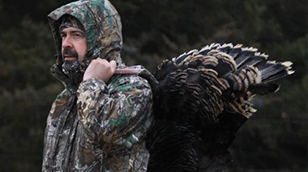 In 2019, Hickoff received the National Wild Turkey Federation’s Tom Kelly Communicator of the Year Award for his longtime work promoting hunting and conservation as a turkey hunting writer, editor and book author. He's hunted wild turkeys across the United States and in Mexico.